Summer is not the time of the year for me to be lax about eating sweets. But I have a serious sweet tooth. The heat and dehydration from a hot day make me crave something cold – something cold and sweet actually. But I’ve found a few ways to help those cravings. I’ve rounded up my favorite summer products that happen to smell like delicious, citrusy, desserts. Check it out! I first heard about Herban Essentials Towelettes a long time ago when Birchbox put a towelette in one of my boxes. I love these freshness-packing towelettes for any time of year, but they are absolutely perfect for the summer. Although it’s a bit of an indulgence, I sometimes use a towelette on the back of my neck when I feel smelly and exhausted on a hot day out with the family. Without a doubt they are easy to keep in a bag for emergencies or quick touch-ups. They also come in Orange, Mint, and Eucalyptus! Talk about refreshing. If skincare were a town I would live on the side of the railroad tracks where masks and treatments are looked at with skepticism, in favor of the tried and true methods. Basically I question how effective it is to do a bi-weekly mask, a weekly detox, or a pre-event peel. 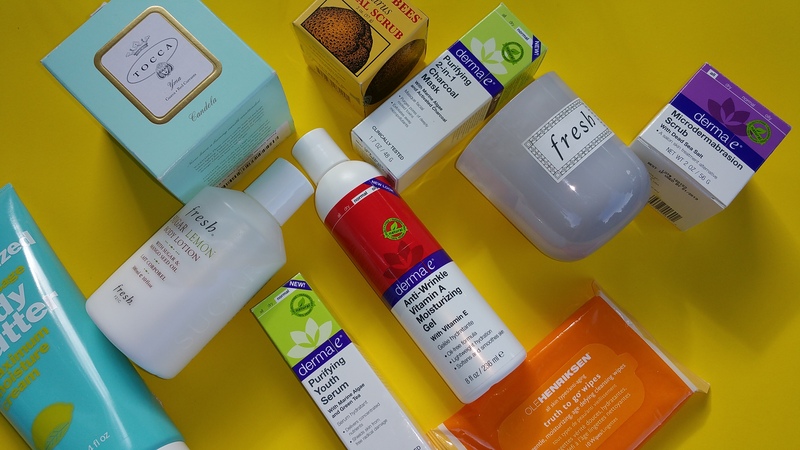 This agnosticism has become a crusade against quick fixes, more so since sheet masks exploded in popularity and have appeared in every single one of my beauty subscription boxes: Birchbox, Allure, Target, Glossybox, BeautyFix, Ipsy… Imagine a gallon zip lock bag full of sheet masks, and you’ll get a sense of how many I have stored away and never touched. But I love a good challenge. I dared the world to prove me wrong. Where am I going here? The fact that I am about to gush over a scrub means it did something serious to my skin. After using this one time, I feel like I had a professional peel done (which I never had actually, but I’m guessing it feels this good). I feel glowy and refined. My face is incredibly smooth and soft. I’m not sure I would be quite as crazy about this scrub if it didn’t smell do darn good. At first I thought it smelled like sweet lemon, but I realized it is more limey. It’s kind of like key lime pie…ice cream that is! This superstar is Derma e Microdermabrasion Scrub. Just writing about it made me crave the smell so I pulled out my jar of scrub… and used it even without planning to! Note: I have heard that this scrub can irritate some users, so it’s best to start with a small amount mixed in with your cleanser, as Derma e recommends on the box. Trying to hold onto that feeling of heavenly weightlessness and angelic clean, I like to follow it up with this face gel instead of a cream: Derma e Vitamin A Treatment Gel. This isn’t citrus scented – in fact I don’t detect any scent. But I had to mention it anyway because it’s a summer shoo-in. This product sounded strange until I used it. It’s a clear treatment gel, but substitutes as a moisturizer when it’s hot and humid outside. What a great find. I love not being confined to the typical serums and lotions. But speaking of serums, another great follow-up to the Microdermabrasion Scrub is a new product from Derma e’s purifying line (green colored product packaging) I just received as a promotional item to try: Derma e Purifying Youth Serum. The serum is genuinely light weight and it’s also odorless. It’s a quick step to apply it before lotion, and you won’t even know you have it on! On those gross humid days I like to use a Soap and Glory citrusy favorite in the shower. 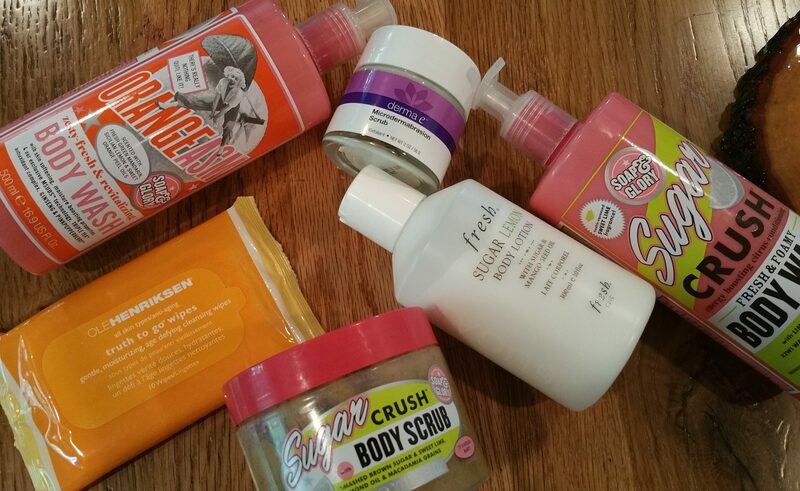 Any of these three will sweeten up my bathroom just perfectly: Soap and Glory Sugar Crush Body Scrub, Sugar Crush Fresh & Foamy Body Wash, or Orangeasm Zesty Body Wash. Soap and Glory is hands down my pick for the brand offering the best value on fun bath and body products. 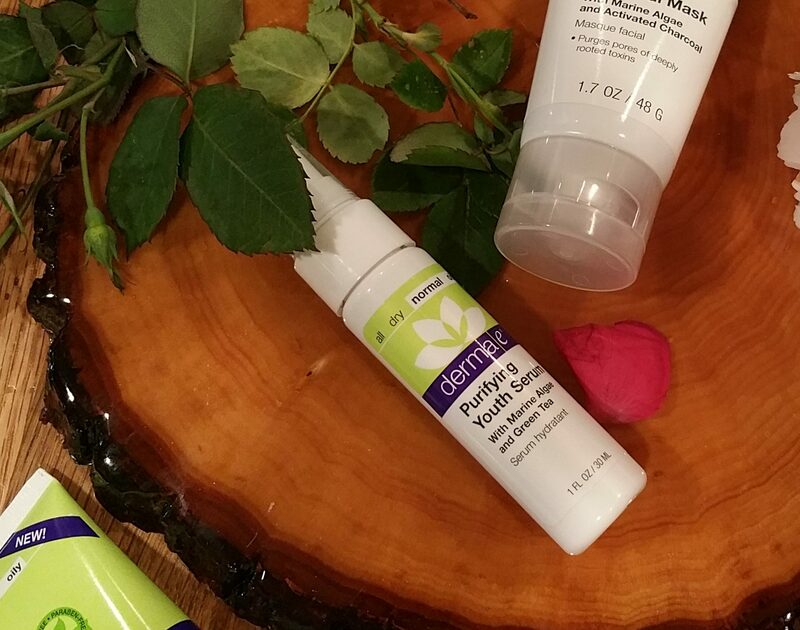 Their Sugar Crush line is scented like amazing key lime (or margaritas, some may say…). I have almost every single scent of Soap and Glory shower gel (see my full spread review from way back here! ), and I pick Sugar Crush and Orangeasm as the two best for the hot months. Follow that up shower with Fresh 21c Sugar Lemon Body Lotion, and you’ve almost overdone the citrus thing, but not quite! Don’t forget the deliciousness of Fresh’s candles too: Fresh 21c Sugar Candle has become one of my favorites. 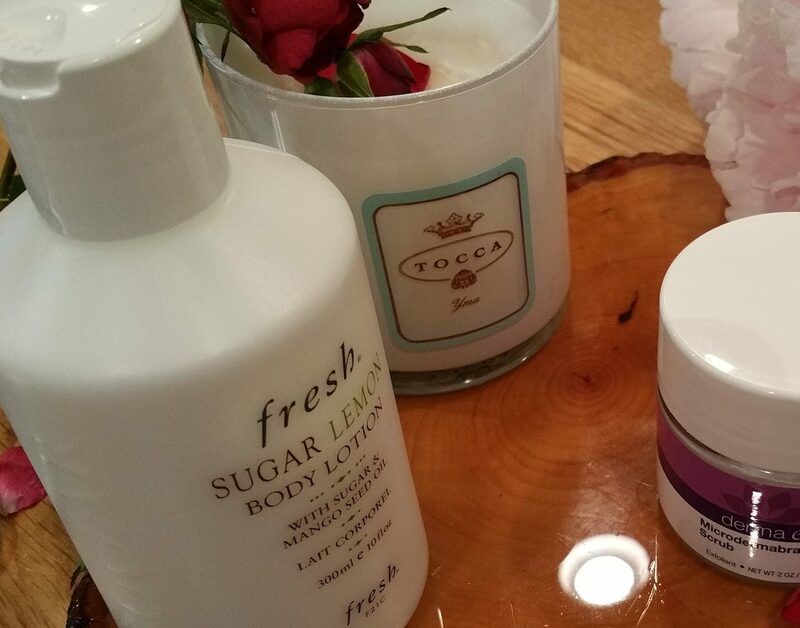 The Fresh Sugar line is lovely (save the lip products which sadly contain chemical SPF), and I highly recommend trying the bar soaps, shower gels, lotions, scrubs, and candles. I noticed that Sephora started carrying the candles! You must try them if you have taste similar to mine! For traveling or when I’m feeling grimy and don’t want to do a complete face wash, my favorite cleansing wipes also smell citrusy. They are from Ole Henriksen: Truth to Go Wipes. They were reformulated to Ole Henriksen The Clean Truth Wipes and I haven’t tried the new formulation yet because I still have a stash of Truth to Go. As long as they retained the heavenly orange creamsicle smell I would bite on the new ones. I have put my Tocca Yma Candle in a prominent location for the Summertime. This candle gives off the most flavorful citrus smell, that is unique but not weird. It’s like a juicy grapefruit (with sugar on it, please). Tocca candles are one of the best options for the mid-price candle buyer. I was sad when Tocca changed their glass jars to white from that gorgeous teal blue they used to be. But even so, I am still a loyal fan. My recommendations are: Yma, Stella, and Violette. 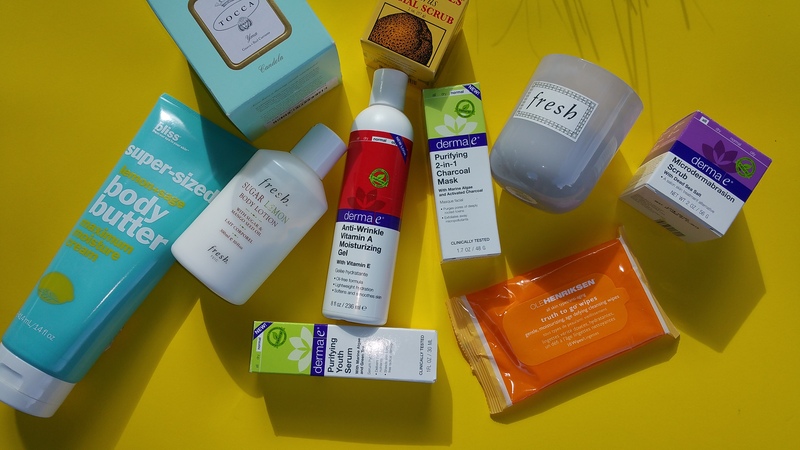 Do you have favorite citrusy summer products? Do tell!